Last week I started to outline how I wrote my short story, Marmara, the ninth story in The Syllabus of Errors. A freewrite from a Joan Miro painting led me to imagine a woman wading out to sea but in a far more northern locale than the painting. Despite being intrigued by this image I had drawn a blank. Sometimes writing fiction is like exploring the jungle. What you think will be a clearing turns out to be a cliff, the lost world high above you, a treacherous climb still ahead. Going over my journals for 2006 and 2007 I notice many other ideas, some mapped out in expansive archipelagos of sketches, stories I have either abandoned or not yet written. One is a story called The Violet Stockings (I can’t remember precisely what it was supposed to be about, something to do with Egon Schiele); another is The Girl with the Feather Boa, the story of one of Klimt’s lustrous models, elderly now, witnessing the Red Army liberate Vienna (I am still hankering for this one). I also had an idea for a sprawling alternative history novel set in a reality where Britain had lost world war one and been subjected to a humiliating Versailles-style treaty, maybe featuring a character in the same amoral mould as Michael Moorcock’s Pyat (more on this gem of an idea later). None of these ideas, including the woman walking out to sea, got off the ground. I was not fully committed to any of them. They were hankerings. Sometimes you hanker after a story you don’t have the experience or talent to write. Sometimes you hanker after a story that you think you ought to write, to please certain editors or outlets or mentors or friends, but you can’t escape the prison of your own scruple. Sometimes you hanker after a story that you don’t have the time to research. How come, then, that I did in the end commit myself to the tentatively entitled Jennifer Strides and not The Violet Stockings? In December 2006 I made a breakthrough. 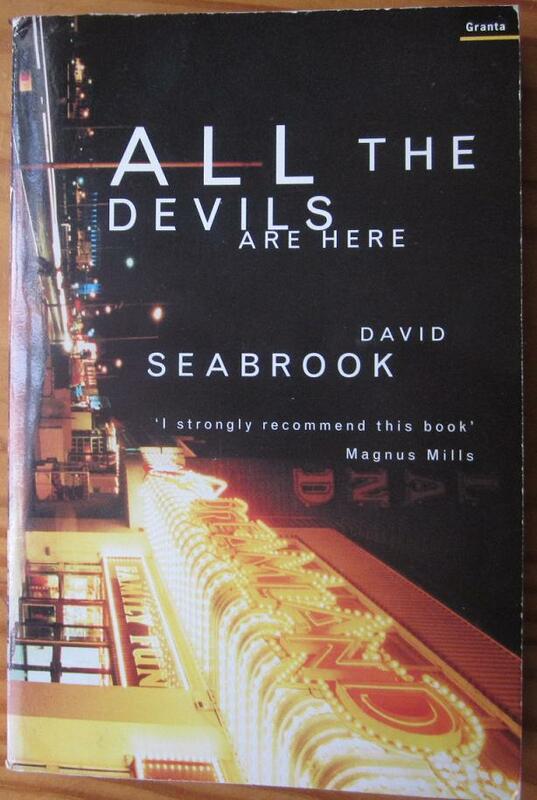 I was reading David Seabrook’s book about Kent, All the Devil’s are Here (recommended by Luke Haines in an article in Uncut magazine), a psychogeographic and underworldly trawl through the county that takes in TS Elliot writing The Wasteland in Margate, a nineteenth century murder that could have provided the source material for The Mystery of Edwin Drood and Charles Hawtry’s drunken rampages around Deal, all tiptop English stuff, murky, seedy and weird. 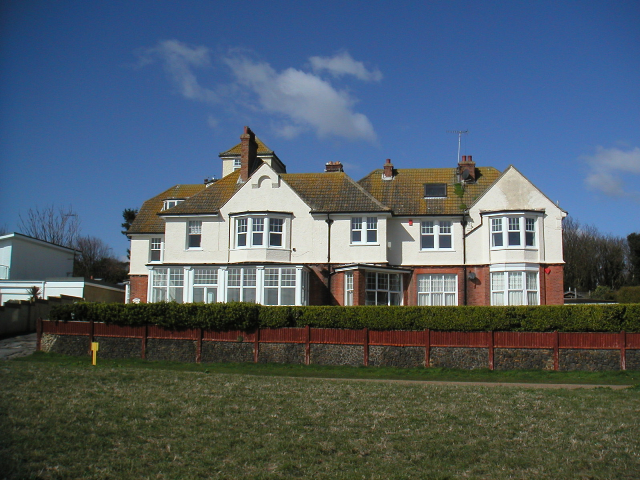 In a chapter about Broadstairs I read about a house on the cliffs, formerly the residence of Lord Curzon and the inspiration for the house in The Thirty-Nine Steps that was owned in the thirties by a Nazi spy. ‘But then I came across something that actually happened out there one night in the summer of 1939. At eleven o’clock on 16th July a teenage girl tried to kill herself by walking out to sea; but at the last minute she lost her nerve and began screaming. Police officers arrived at the headland and came down the steps to find the girl being lead out of the water by a North Foreland employee. She said later that she didn’t know why she had done it. She was very sorry. But then I came across something that actually happened, writes Seabrook. So had I.
Straightaway I made a connection between the events described by Seabrook and the woman walking out to see in codename Jessica Strides. During the hankering phase of a proto-story, you are often waiting for a dialectic; for something new to hook into the story, for the two of these ideas to make a third thing possessing an extra-dimension. In this case, I was suddenly free of the problem I’d so far encountered, that of cliché. Initially, the vanishing point for me was the suicide note read out in court (how cruel to have your suicide note read out in court?). The wording moved me, articulated feelings I could relate to. It suggested that a profound rejection or betrayal was behind the girl’s action. Like Seabrook (“It’s that man again”) I was spinning a spider’s web that connected the girl with Tester, the spy who owned Naldera, the house on the cliffs. I now had something to work with, to fill in. The story had a frame: the night the girl tries to end it all. Without a tight frame a story can sprawl and lack tension. The girl now had a motivation, and importantly for me, is disabused, shorn of an illusion. This is an arc of sorts. Moreover, it now had a setting in time and place. Plus, I had a useful source book and knew enough about the period to feel confident that I could pull it off. The story that had started with looking at Miro had taken yet another turn. The moral of the story here is don’t rush into an idea. Wait for the dialectic (and of course, if you keep a notebook, you should have many ideas that can intersect with one another). By March 2007, the story’s proto-working title had become Starless and another dialectic had occurred. The idea about the Treaty of Versailles being inflicted on Britain had been incorporated, to be used as some sort of aid to seduction by the fascist who snares our wayward girl. Sometimes your glimpses grow into stories. Sometimes your novels are smelted down into paragraphs. Even so, I was still some way off embarking on working title Starless and would, given its period nature, have to do some research. This research will be the subject of next week’s blog. 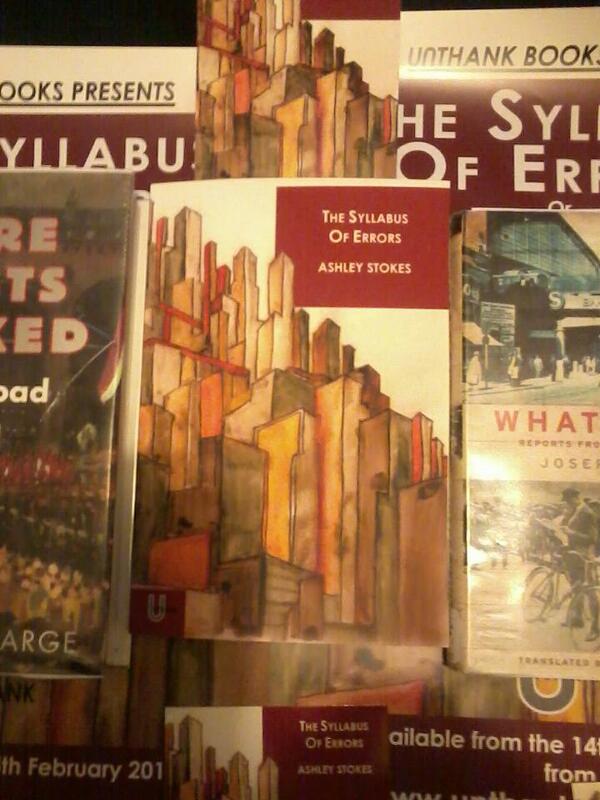 Marmara is the ninth story in The Syllabus of Errors, available from the Unthank Books Online Bookstore, Amazon, The Book Depository and all good bookstores.